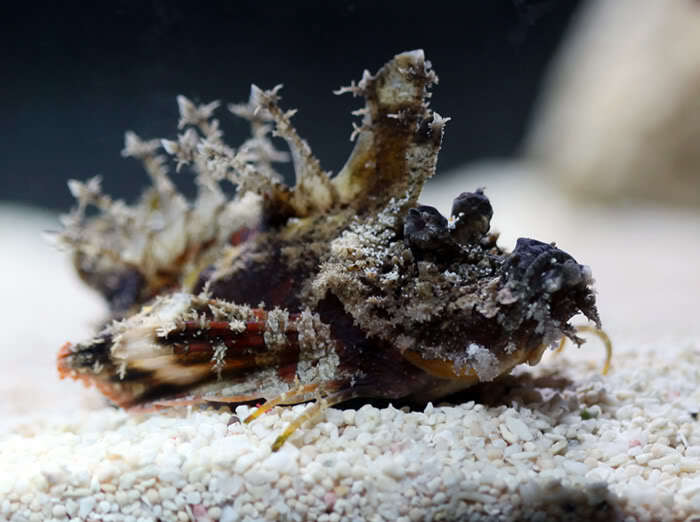 The Sea Goblin (Inimicus didactylus) is a fascinating but venomous fish. They grow to about 8 inches but do not require a large aquarium as they spend most of their time buried in the sand waiting to ambush their prey. I recommend keeping them in smaller aquariums until they are trained to eat frozen foods because it’s much easier to make sure they are eating enough. These fish should be purchased with the assumption that you’ll have to feed them live foods for their entire life as it’s quite a challenge getting them to accept frozen foods. The one pictured is one of mine and I feed it a mix of grass shrimp and minnows that I keep on hand at all times. Care must be taken not to overfeed the Sea Goblin as food can rot in its stomach, causing death. I feed mine 1-2 times a week. They have venomous dorsal spines similar to lionfish so be careful if you do purchase one.